Thanks to the quality of the services it provides, and the clean and safe bathing, the town has been awarded the prestigious Blue Flag of the Foundation for Environmental Education in Europe. Although its prosperity nowadays depends on the tourists, Senigallia is a town with a long history. Its name bears witness to its earliest inhabitants - the Galli Senoni, a Celtic tribe who settled here around the 4thC BC. In the 15thC it was widely celebrated for its enormous commercial fair - the Maddalena Fair. The tourist guide of Senigallia will suggest a guided tour of the most remarkable sites of Senigallia. The finest monument is the old fort, the Rocca Roveresca, built in 1480. Senigallia's other great pride is the large number of good restaurants where you can try the best of the Adriatic catch. 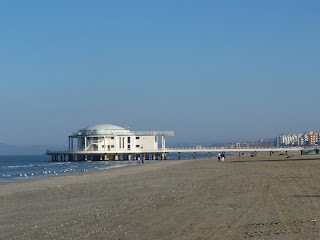 There are also a lot of hotels, camping, villages, renting room along Senigallia's promenade, attracting tourists from Italy and all over the world.